According to the Frankston Leader, a mystery man in Australia has been putting up funny road signs that have some local residents laughing, and others fuming mad. 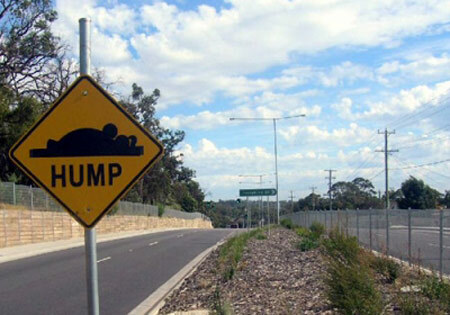 The first three photos in the gallery below show you just how real these fake signs appear, and while two are rather innocent, the first image in the gallery shows a sign of two people copulating in the horizontal position with the word "HUMP" below. It was placed next to a speed bump. The source, of course, quotes a 63-year-old Australian woman who calls the sign "blasphemous" and "obscene". The local government is also not amused, but whoever is putting up these signs usually takes them down before the authorities can do it themselves. Thanks for the tip, Scott!